12 new historical scenarios, each one including at least one of the three new nationalities. 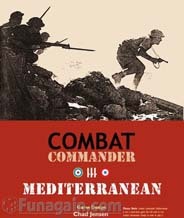 An updated Random Scenario Generator incorporating the new nationalities and the twelve new maps, as well as allowing for the early years of fighting in 1939 and 1940. This random scenario system provides an almost unending variety of map configurations, force structures, and combat situations. Replayability value for Combat Commander gets even better with this new addition to the family. A complete manifest of all 432 Fate Cards included in CC:E and CC:M. Number crunchers rejoice! Assigned Point Values for all units, weapons, radios and fortifications in CC:E and CC:M, allowing players to easily create their own scenarios and Orders of Battle. Additional designer's notes and play hints. Combat Commander is one of those rare exceptional values in wargaming -- one that can be revisited time and time again, each with a new tale to tell.